NASA has launched a ship which will go closer to the sun than any human ship has ever gone before. It will collect important information about the area that surrounds the sun. In 1958, a scientist named Eugene Parker said that the sun sent out a stream of very tiny invisible objects, called particles. He called this stream of particles “solar wind”. One reason he got this idea was because the tails of comets are always pointing away from the sun. It was as if the sun was blowing the comets’ tails. When Dr. Parker shared his idea, almost no one believed it. Many people laughed. But Dr. Parker was right. 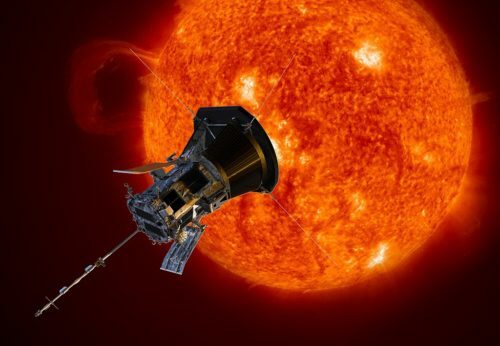 This is an artist’s idea of what the Parker Solar Probe will look like near the sun. Now NASA is sending the “Parker Solar Probe” to the sun to learn more about solar wind. A probe is something that collects information. “Solar” means “of the sun”. This is the first time NASA has named a ship after a living person. The probe was launched on Sunday using a very strong rocket. But for most of its trip, the probe will travel on its own. It will go around the planet Venus seven times and around the sun 24 times. The probe was launched on Sunday using a very strong rocket. For most of its trip, the probe will travel on its own. The probe will speed up as it goes and will soon become the fastest moving thing humans have ever built. 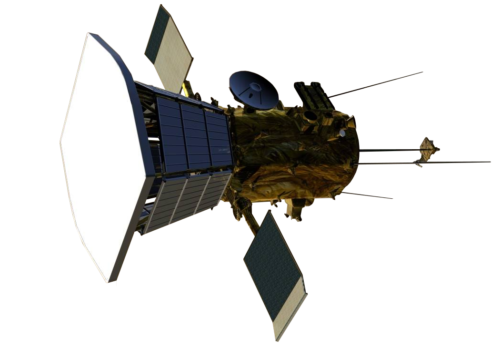 At its fastest, the probe will be moving around 430,000 miles per hour (690,000 kilometers per hour). The probe’s job is to study the outer part of the sun, which is called the “corona”. 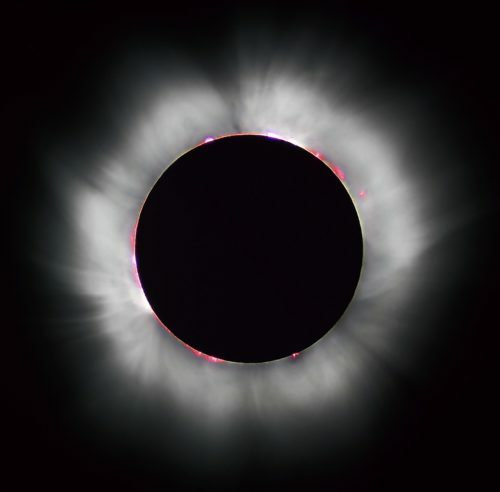 If you’ve ever seen a simple drawing of the sun as a yellow ball with lines coming out of it, the corona would be the part where the lines are. The probe will touch the sun’s corona, which goes millions of miles into space. This picture was taken during a solar eclipse. The sun is blocked out, but you can see the corona. The corona is much hotter than the surface of the sun. NASA is hoping that the probe will help to explain why. For the project to work, the probe had to be able to control itself. It would take too long to control the probe from Earth. It takes 16 minutes to send messages from the probe to the Earth and back again. The probe could get damaged in less than a minute, if it’s pointed the wrong way. The probe needs to keep its most protected part facing the sun. The probe can stand temperatures as high as 2,500° Fahrenheit (1,400° Celsius). That’s why the probe can turn itself so that its most protected part is always facing the sun. The probe is protected by special, thick foam. This allows it to keep cool inside, even when the heat is as high as 2,500 degrees Fahrenheit (about 1,400 degrees Celsius). The probe will not touch the actual ball of gas that is the sun. But it will come close. At its closest, it will be just 3.83 million miles (6.16 million kilometers) away. That may sound like it’s far away, but the sun’s corona goes that far out into space. No spacecraft has ever come that close before. Dr. Eugene Parker was the first one to describe solar winds in 1958. 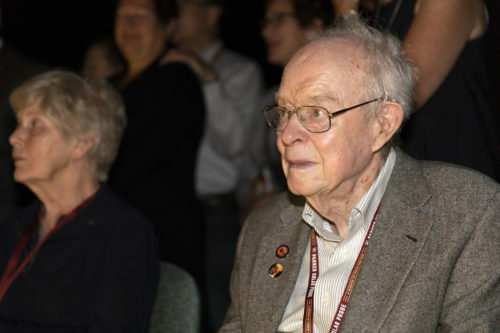 This is Dr. Parker, who is 91, watching the launch on Sunday. The probe should arrive near the sun for the first time in November. 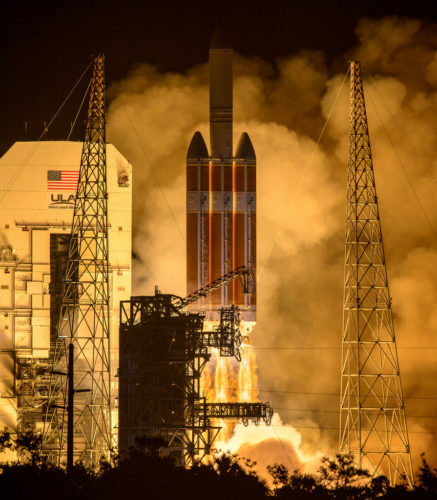 Here’s a good site for students to learn more about the Parker Solar Probe: NASA’s Parker Solar Probe. The world’s largest plane took off on Saturday for its first flight ever. The Stratolaunch, which was created to send rockets into space, completed its 2.5 hour test flight and landed again safely. On Sunday night/Monday morning, people in North and South America, as well as some parts of Europe and Africa will have a chance to see a total eclipse of a “super blood” moon.